Lady has a home! 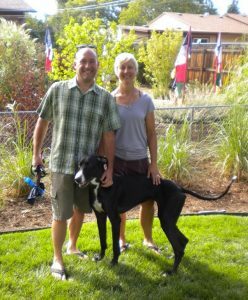 - Rocky Mountain Great Dane Rescue, Inc.
Lady has a home with her new adoptive family in Erie, CO. Janette and her husband Scott and their 9 year old cat have been waiting for the right moment to fill the hole in their home that their 14 year old lab mix left when she passed earlier this year. Scott has had Great Danes in the past and they both feel that Great Danes share similar qualities that labs have…sweet in nature and who want nothing more than to be close to their humans. They want to take Lady on long walks in the morning and everywhere they go! She will get so much loving undivided attention. Janette & Scott have affectionately renamed Lady to “Moxey”. Way to go sweet Lady!